When disconnecting the steering intermediate shaft assembly and pinion shaft of steering gear assembly, be sure to place matchmarks before servicing. 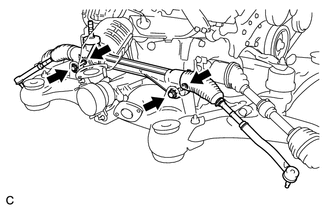 (a) Install the lock nut and tie rod assembly LH to the steering rack end sub-assembly until the matchmarks are aligned. After adjusting toe-in, tighten the lock nut. Perform the same procedure as for the LH side. 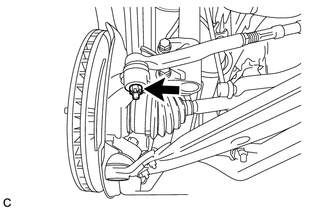 (a) Install the steering link assembly with the 2 bolts and 2 nuts. Make sure to tighten the bolts starting from the left side of the vehicle. Because the nut has its own stopper, do not turn the nut. Tighten the bolt with the nut secured. 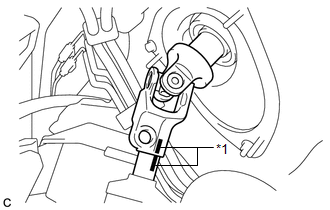 (a) Connect the tie rod assembly LH to the steering knuckle with the nut. 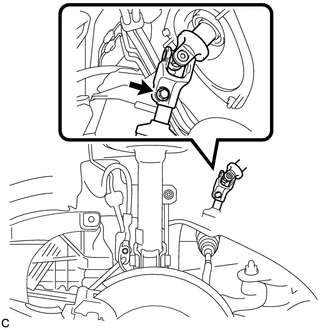 (b) Install a new cotter pin. Further tighten the nut up to 60° if the holes for the cotter pin are not aligned. 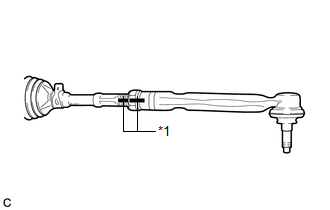 (a) Align the matchmarks on the steering intermediate shaft assembly and steering link assembly.